The 29th September marked the beginning of UWC Red Cross Nordic’s Thor Heyerdahl Week – our College’s contribution to celebrations planned across Norway for the centenary of Thor Heyerdahl’s birth on Monday October 6th. Thor Heyerdahl – archaeologist, author and explorer – played a hugely significant part both as International Patron of the United World College movement and, at a later stage, in developing the concept of a United World College in Norway. We continue to be grateful for the support and energy he committed to the establishing of our College in the fjords. Please click here for the speech given by Thor Heyerdahl at the official opening of the College on 30th September 1995. Thor Heyerdahl Week at RCN included: a presentation on the life and legacy of Thor Heyerdahl, a screening of the film ‘Kon-Tiki’, and a student-led raft-building project. Students this weekend have braved apocalyptic rains to build their own version of Kon-Tiki; the challenge is for the students to attempt to sail the raft across Haugland Bay. Here are some images of the work done so far on the raft. Indeed on the day of the centenary itself, our Board Chair Tove Veierød, has invited the current Oslo-based Nordic ambassadors to a reception at the Nordic Association where Rektor Richard Lamont will speak about the vision of Thor Heyerdahl and the other members of the founding team of this College. The text of his speech is here. A delegation from UWC RCN will be meeting with Maja Bauge, the Director of the Kon-Tiki Museum, on Tuesday 7th October. Heyerdahl taught us of the possibilities of living on a raft or papyrus ship within speaking and touching distance – day and night – with ‘room only for people who could shake each other by the hand’. Following in the footsteps of Thor Heyerdahl and those responsible for the founding of the College, we continue to encourage our students and staff to contribute to society, both now and in the future, by reaching an open hand to fellow humans everywhere. 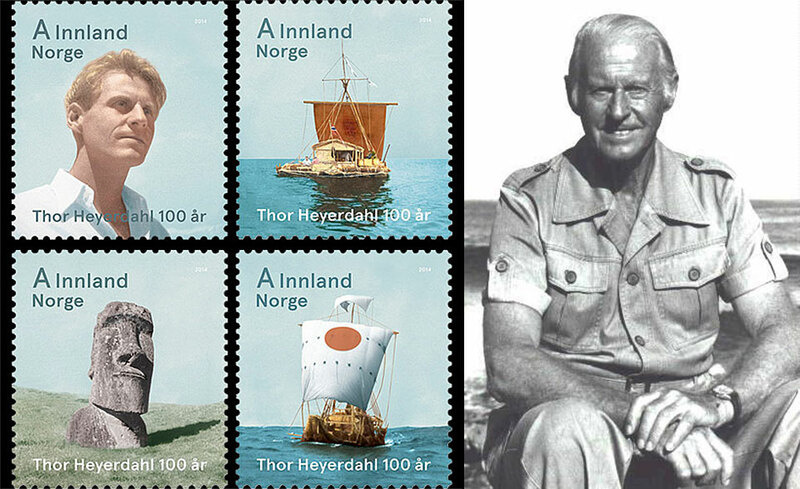 Click here to see an excellent documentary about Thor Heyerdahl. It was a pleasure and privilege to welcome Amy and Phil Geier this week to UWC Red Cross Nordic. Fresh from the inauguration ceremony at UWC Robert Bosch College, Amy and Phil arrived on campus on Tuesday evening and proceeded to take a full part in College life – from meetings with staff and students to participation in lessons. At the invitation of the Admissions Team at Middlebury, Amy kindly agreed to meet with students on an individual basis to give an introduction to studying at the College in her capacity as a Middlebury Fellow. Phil, as co-founder and executive director of the United World College Scholars Programme, gave a presentation on the history of the partnership between Shelby Davis and the UWC movement alongside an introduction to new projects focused on bridge / gap years including the Semester at Sea Programme and the Global Citizen Year. In the late 1990s, Shelby and Phil started with a simple idea: provide scholarships to talented international students at American colleges and universities, which they hoped would transform those students’ lives and enhance the global diversity of American higher education. This founding aim has blossomed into a strategic objective that now advances international understanding through education built on the following twin principles: 1) that promising future leaders from a broad range of cultures should be afforded greater educational opportunities and serve to accelerate global networking; 2) that these educational opportunities take place at leading US colleges and universities, in the belief that these American schools will become more effective learning communities for all their students by becoming more internationally diverse and globally engaged. 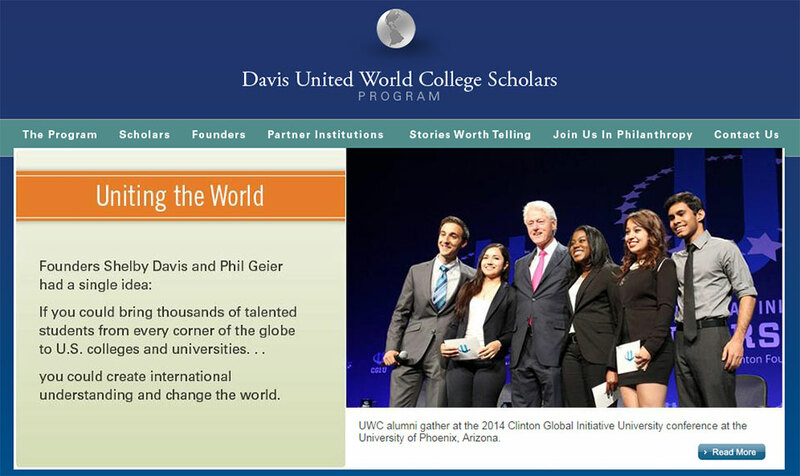 In the academic year 2013-4, 5,508 graduates from UWCs (and representing 148 countries) studied at 91 US universities as part of the Davis UWC Scholars Programme. 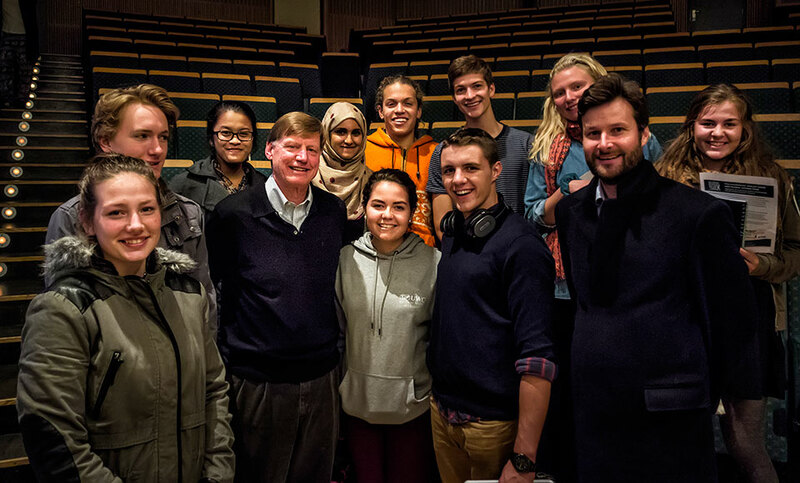 Phil presented to a packed auditorium and responded to a series of stimulating and thought-provoking question from students on the history and future of the programme – and certainly fired the imaginations of those considering studying at US universities. This was the third time Phil and Amy had visited the College. They were first here in 1995 for the opening ceremony when Phil was the President (equivalent of Rektor) of UWC-USA and then again ten years ago – and we so look forward to welcoming them back to UWC Red Cross Nordic in the future. We wish them safe travels in their European tour which will now take them to the International Office in London, to UWC Atlantic College, to UWC Maastricht, to a short expedition on a Semester at Sea voyage, and finally to the inauguration ceremony at UWC Dilijan. We appreciate and applaud both Amy and Phil for their extraordinary commitment to the UWC movement. 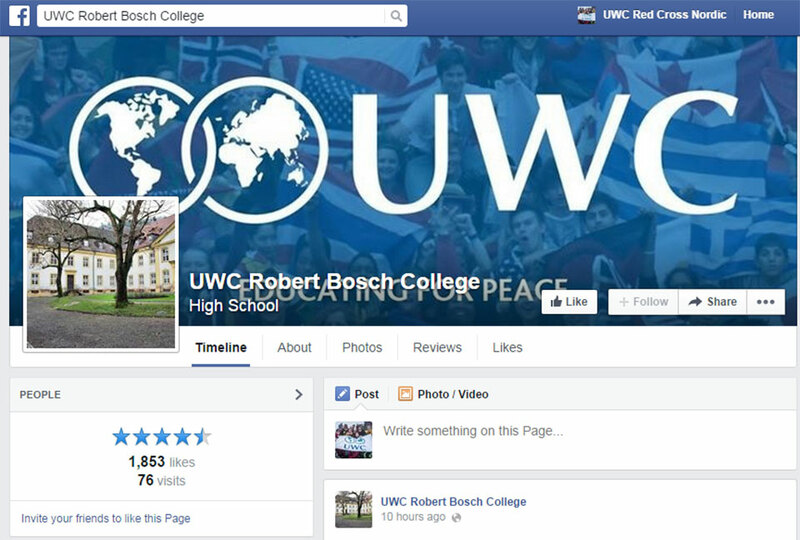 The students and staff at UWC Red Cross would like to express our delight that – after years of preparation – UWC Robert Bosch College in Freiburg is opening its doors on the 23rd of September 2014 as the 14th UWC College worldwide. Tove Veierød (Chair of UWC RCN) and Tom Gresvig (one of the founding team of UWC RCN) shall be attending the opening ceremony as representatives of our College. It is particularly exciting that a UWC College has been established in Germany – home to Kurt Hahn (1886-1974), the educational pioneer responsible for founding the UWC movement. We wish the first cohort of students and new members of staff (drawn from Germany and across the world) all the very best for the academic year ahead. On 15th September UWC International Patron Shelby M.C. Davis and Anand Mahindra, Governor of UWC Mahindra College and Chairman of India’s Mahindra Group, announced that together they will provide major new support for the UWC movement. Jointly they are committing a total of US$12.5 million scholarship funding over the next five years. Shelby Davis will contribute US$7.5 million, US$1.5 million a year for the next five years. Of this total, US$5 million will provide additional funding for the Davis Scholarships, which already support more than 100 Americans to attend UWC-USA in New Mexico and the 13 other UWC schools and colleges. The remaining US$2.5 million will continue Mr Davis’ support for the Davis International Scholarships, established a decade ago and operating in every UWC college. The Mahindra Group will contribute Rs 300 million (approximately US$5 million), Rs 60 million a year for five years, in support of need-based scholarships for students at UWC Mahindra College. These funds will be transformational for UWC’s Indian college and are expected to support 50 new scholarships each year, 25 for Indian students and another 25 for students selected by UWC national committees in other countries. Sir John announced that the joint initiative of Shelby Davis and the Mahindra Group will be recognised by a renewal and extension of the existing Davis International Scholarships. From 2014-15 onwards four outstanding second-year students at each UWC institution will be named ‘Davis-Mahindra International Scholars’.